** The number one bestseller Big Little Lies is now a HBO series starring Nicole Kidman, Reese Witherspoon, Michael Fassbender and Shailene Woodey ** 'Let me ask you a question. Would you like a series that has everything? Good. Because it is, emphatically, HERE' The Guardian Perfect family, perfect house, perfect life; Jane, Madeline and Celeste have it all ...or do they? They are about to find out just how easy it is for one little lie to spiral out of control. From the author of Truly Madly Guilty and The Husband's Secret comes a novel about the dangerous little lies we tell ourselves just to survive. Jane hasn't lived anywhere for longer than six months since her son was born five years ago. She keeps moving in an attempt to escape her past. Now the idyllic coastal town of Pirriwee has pulled her to its shores and Jane feels as if she finally belongs. She finds friends in the feisty Madeline and the incredibly beautiful Celeste, two women with seemingly perfect lives - and their own secrets. But at the start of a new term, an incident involving the children of all three women occurs in the playground, causing a rift between them and other parents. Minor at first but escalating fast, until the whispers and rumours become vicious and spiteful, and the truths blur into lies. It was always going to end in tears, but no one thought it would end in murder ...'Brilliant, stand-out, superbly clever. 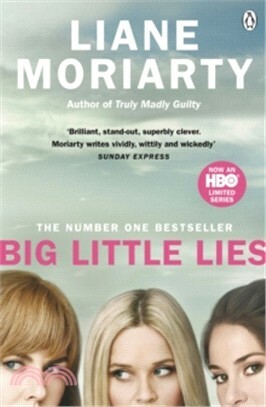 Moriarty writes vividly, wittily and wickedly' Sunday Express 'Blame and guilt, forgiveness and retribution, love and betrayal.